A question we often get is “If I want the highest number of users, should I make my app Free or Paid?” The mindset behind a Paid app being that perhaps you can recoup some costs and do more then the Free app would provide. We typically push for clients to not charge users upfront to install their app. The price, however small, is a barrier to users discovering your app and downloading it to take a look at it. Statistically, your app has 30 seconds to prove its value. This means that people download an app and delete it almost immediately if they can’t figure it out or if it doesn’t work. With such fickle users, it is not a good idea to put up a pay wall before people can “look at the goods”, so to speak. Even as an app development company, we will often hear our developers say “$2. Geez, I don’t know…” It’s a good way to lose potential customers. Most apps are free to install, and the percentage of free apps versus paid apps is increasing. This is because people don’t want to pay for apps up front, and the app development community has figured this out. Rather than an upfront cost, people are finding other ways to monetize their app via channels like in-app purchases or advertising. The best ammunition is to go to the app store and pull up the list of “Top Grossing” apps. These are the apps that make the most money, regardless if it was upfront or in-app. 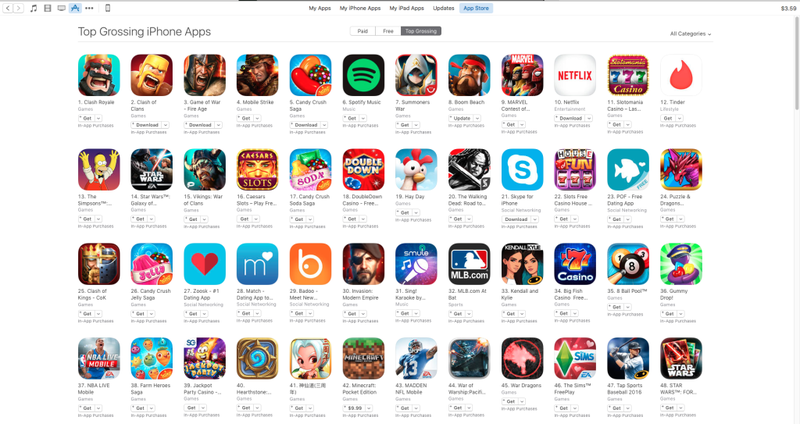 In that “Top Grossing” apps list, there is currently just a single app that is a Paid app. Every other app in that list is free to install. Developing an app is hard work, and making money from the app is not much easier. Free apps do not blindly bring in greater profits than paid apps do, there is no definite right or wrong monetization strategy to make sure all apps make a profit. The trick lies in choosing the right model for your industry and the kind of app you’re offering. Some savvy entrepreneurs even design their apps after choosing a monetization strategy. Using the right monetization model will ensure your app gets noticed and that the revenue starts rolling in.